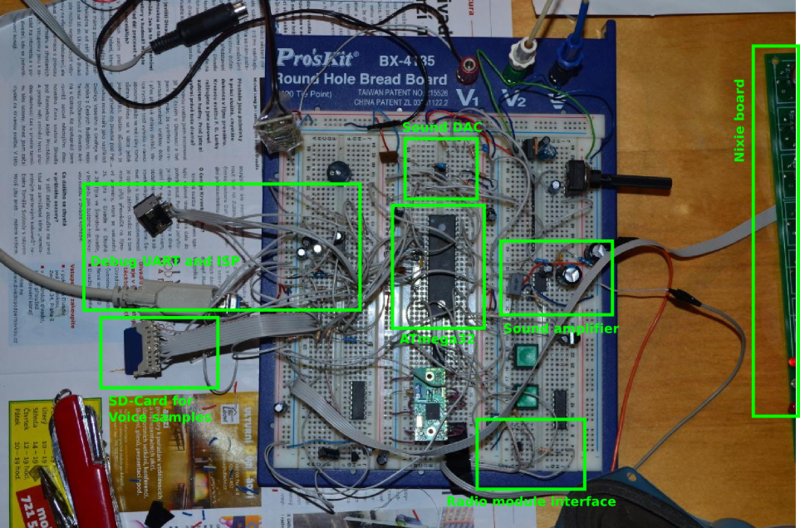 I am working on a talking clock with a remote IR control. The idea is that when I awake at night I don’t have my glasses on, hence I cannot recognize digits on a clock display. So I figured out that what I need is a talking clock that could tell me the time aloud. The audible announcement is triggered by a button press on a standard infrared remote, normally used to control my hi-fi equipment. As you can see in the video the display board (using six nixies, of course!) is finished but the ‘mainboard’ is still being in the works. Time control: Radio DCF77 module (automatically synchronizes to the German time), backed up by a precision 32.768kHz crystal. I was looking for a talking clock with remote and not finding it. I was thinking about patenting the idea. (I have an extra thought that I believe would allow for a design patent). I know a good deal about design patents and have traveled to Taiwan in the past to work with Electronic Factories. I believe that there is a market to get a clock like this sold to millions. We need to get it designed, patented and packaged. Then sell it on TV commercials. It would be good for Shark show. What do you say we work together on it? Great work, i like it. I read your excelent articles. Thanks a lot for sharing. That Clock-Project. Altera Cubic Cyclonium watch with LED Matrix. Included was a Source-Code CD. Year 2003 .
reconfiguration on a FPGA [EP1C6F256] .